This easy stroll is a wonderful way to see Kirkby Lonsdale and its many delights, the only climb being the '86' radical steps just before you reach Ruskin's view. This short circular walk can be started from any part of the walk and if you want to break off to enjoy Kirkby Lonsdale's many shops, narrow lanes, pubs, restaurants and tea rooms, you can. Kirkby Lonsdale is a historic market town, known by many for Devil's Bridge, dating back to around 1370 and Ruskin's view, which he described as the loveliest view in England and therefore the world. The scene has also been painted by Turner. Both these are visited on this short walk. The centre of Kirkby Lonsdale is a mix of elegant well preserved 18th-century buildings and stone cottages built around cobbled courtyards and narrow alleyways with names such as Salt Pie Lane, Horse Market and Jingling Lane. Parking: The walk starts from the parking area on the road that leads down to Devil's Bridge (grid reference SD 614 782). As this is free parking it can fill quite quickly, especially at weekends. 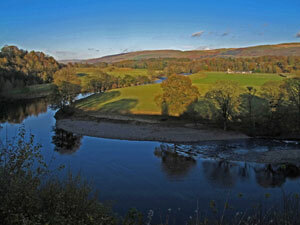 There are several other pay and display car parks in Kirkby Lonsdale that can be used and then the walk can either be joined part way round, or simply walk the five or so minutes from the pay and display down to Devil's Bridge. Facilities / refreshments: Many pubs and cafés in Kirkby Lonsdale - there is often a refreshment van at Devil's Bridge. Toilets at Devil's Bridge. Leave the parking spaces and head downhill towards Devil's Bridge. After admiring the view from the bridge, take the footpath through a metal kissing gate on the same side of the road as the toilets heading back towards the parking spaces, following the green footpath sign for "Town Centre and Ruskin's View". Immediately on going through the gate, take the path diagonally down to the right, which after a few yards reaches the edge of the River Lune. If you do not want to go down to the water's edge, then carry straight on keeping to the right of the fence. Continue walking away from the bridge for a couple of hundred metres, then head back left up the banking to rejoin the path by the fence. Continue along this path, all the while heading away from the bridge. Follow this path for a further few hundred metres where the path leaves the fence to go around the right-hand side of a large tree. Shortly after this, go through a metal kissing gate, then four steps must be climbed and descended on the left-hand side of the path, to get round the metal chain, which crosses the path. Continue ahead on the now metalled path, which is now by the side of the river. After a further 70 metres the path again becomes un-metalled, and continues on past a large stone faced house on the left opposite a grassy picnic area. Continue ahead along the side of the river following the sign for "Radical Steps and Ruskin's View". The path slowly heads downwards and becomes bounded by a stone wall about two metres in height on the left and the river on the right. When the wall ends turn left up the Radical Steps. The Radical Steps were built in 1819 by Francis Pearson. They were called Radical by the locals, due to Pearson's radical political persuasion. At the top of the 86 steps of seemingly different sizes, turn right at the Gazebo following the sign for "Ruskin's View 100 yards". Upon reaching Ruskin's View there is a board showing the layout of the surrounding hills. The view here was described by John Ruskin in 1875 as one of the loveliest in England, therefore the World. Painted by Turner in 1822, the scene presents a gentle panorama of river, meadow, woods and hills in almost perfect balance. The panoramic view ranges from the Howgills in the North along over Middleton Fell, Calf Top and then round to the East to Gragareth and Ingleborough. The landscape is as a result of the formation hundreds of millions of years ago of the ancient rocks of the Howgills and Middleton Fells to the left and the later limestone Hills of Gragareth and Ingleborough to the right. Having initially been led down under the sea these hills were then left high above the flatter land by vertical shifts in the earth's crust along the fault lines which run from left to right. The higher ground and the valleys were gradually eroded and weathered by glaciers and rainwater over many thousands of years, with the soil being removed and deposited to from fertile meadows in Middle Lunesdale in front of Ruskin's View. Turn round and head back to the towards the top of the Radical Steps, this time continuing straight into the graveyard down the left-hand side of St. Mary's church, the oldest building in Kirkby Lonsdale. Where the path forks with the right-hand fork continuing on in the graveyard, take the left fork at a black lamppost down a small cobbled alleyway, which leads out into the old market square. Cross the square and turn right into Mill Brow for the few yards which leads up onto Main street. Upon reaching this road at the Wine Merchants, turn left and follow the one-way street past the Red Dragon Public House until a road junction is reached. Turn left onto this road (Town End), effectively almost continuing on the same direction, along the top of the Market Square, past the Tourist Information, then on for a further one hundred metres where the A65 is reached. Turn left onto the A65 following the sign for Skipton for about fifty metres, before turning left back down to the car parking spaces.